There are those who view solenoid valves as merely a commodity, and there are those who are interested in long-term reliability. Unfortunately, however, low cost and high reliability may be divergent ambitions when it comes to valves. Engineers seeking operational longevity and high-quality performance should think beyond initial purchase price, as any other strategy is likely to cost far more in the long run. The overall reliability of any system in a process plant cannot exceed the reliability of the final link in the control chain. In many cases this final link is the remotely-operated valve that starts or stops the process. Often, these valves are piloted by a ‘simple’ solenoid valve. A solenoid valve is essentially a device for electrically interrupting or diverting the flow of fluid in a pipe. There are many different types, but all operate on the fundamental principle of an orifice being covered or uncovered to allow, stop or divert flow. Applications are varied, ranging from valve actuation control for standard on/off and control valves, the control of specialist valves such as high integrity pressure protection systems (HIPPS) and emergency shutdown (ESD) valves, through to the direct control of fluids in applications like fire deluge control or the control of utilities such as steam, water and air. Solenoid valves are also widely used in pneumatic systems and controls. In all cases, reliability of operation is paramount. Driven by cost pressures, some engineers and purchasers buy solenoid valves based on price. They specify a solenoid valve that will do its job but mistakenly believe all valves are created equal, thinking that very little can go wrong with these seemingly simple devices that typically comprise of a coil, plunger and sleeve. On that basis people may see the solenoid valve as a commodity item. The reality, however, is far different: a highly-engineered solenoid valve may come with a higher purchase price, but its lifetime costs are far lower than other commodity counterparts. To support the false economy theory, consider a conventionally-engineered solenoid valve. These tend to use O-rings as valve stem packing to prevent leakage; a design that has many flaws. The sealing ability of the O-ring reduces over time due to the deterioration of the rubber, subsequently enabling fluid to pass. Contaminants in the fluid or fluid residue are then able to accumulate on the valve stem, causing increased friction. Some designs require a breathing hole to ensure smooth valve stem movement. However, a breathing hole exposes the valve internals to contaminants from the atmosphere, which can also build up on the stem. All of these facts can lead to slower response times and potential failures. In ESD and HIPPS situations, every fraction of a second is vital. In order to overcome this increased friction, some suppliers will use a stronger spring force so that as the friction increases the valve will still operate. In order to overcome this spring force, a high FFR (Force Friction Ratio) is required, subsequently demanding a higher power solenoid. As the power increases more heat is generated. An increase in temperature can negatively affect the lifetime of the solenoid. In addition to the potentially reduced lifespan, a higher powered coil may also affect installation costs as thicker wiring may be required, or engineers may have to have fewer valves on the same control loop. Failed solenoid valves result in downtime, with all of its inconvenience and cost. Moreover, what if the solenoid valve is found to be seized in an ESD situation? In extreme cases, it could prove fatal. Emerson’s ASCO 327 Series is a universal, 3/2, direct acting (balanced poppet) solenoid valve available in multiple variations of materials, power, flow and certification. The valve is suitable for a wide variety of applications, such as actuator piloting, compressor unloading and utilities control, and also as part of a broader offering of engineered solutions that includes actuator control packages, redundant control systems and bypass panels. With its unique design and strong safety accreditation, the 327 Series is a proven safe, reliable and adaptable solution that can withstand even the most demanding environments in the process industry. The valve is explosion-proof and exceeds the stringent requirements of the oil and gas sector. The robust build quality of the 327 ensures reliable operation, while the non-breathing design, unique seal construction and extended coil life make these advanced solenoid valves inherently reliable to ensure the long-lasting safety of the application. Furthermore, each valve coil is designed and manufactured in-house by Emerson. There are many features of the 327 that are designed to reduce engineering time and commissioning costs. For instance, the valve’s unique under-pressure manual operator (MO) can be removed without isolating the valve or shutting down the instrument air system. Further benefits include low-power options that reduce the size of power supplies and cabling, NACE compliant materials that cut corrosion risk, epoxy H Class coils for extreme long life expectancy, inherent vibration resistance, and the presence of a permanent air gap – even when energised – that reduces any risk of sticking caused by residual magnetism. To help outline the benefits of selecting high-quality, reliable solenoid valves, consider an ESD valve piloting application at an oil refinery. For a typical ESD application, the solenoid valve is energised to open the process valve during normal operation. Thus, in the event of an emergency, the solenoid valve must de-energise and close quickly to shut down the process valve. As this type of solenoid normally operates in standby mode for long periods, O-ring ageing and increased friction will slow down its closing response. To measure the closing response time of a solenoid valve after a period in standby mode, a dormancy test was conducted. The result showed that the ASCO 327 was much faster than many competitor products, which incidentally had a larger spring return force. 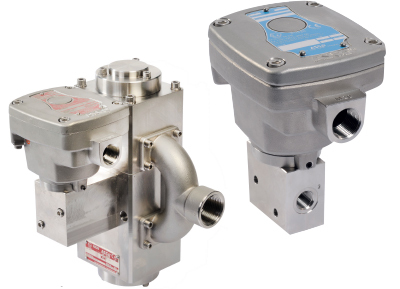 Therefore, ASCO valves demonstrate more consistent and reliable behaviour over time than other similar products.